Many gardening books can be helpful to cacti and succulent gardeners. While some titles deal with how to grow the plants, other gardening books offer ideas on how to use cacti and succulents in the landscape. Those looking for inspiration will love these two books. “A Garden Gallery-Inspiration from an Enchanted World of Plants and Artistry” by George Little and David Lewis features lush color photos by Barbara Denk. This was released by Timber Press. The authors/artists are well known not only for their art but also for the garden that surrounds their studio. Their garden has become world famous. In this enlightening book, they reveal some of their gardening secrets. This book will be especially helpful to cacti and succulent lovers. Many of the garden design ideas feature these plants. The authors devote a chapter to each feature or aspect of gardens or garden design. Instead of applying rules to the garden design process, they advocate a free spirited, playful approach. This book has numerous lists of recommended plants. Among the featured cacti and succulent species are the ice plant, spurge, epiphyllums, agave, burro’s tail, echeverias, a number of senecios, and Autumn Joy sedum. By applying ideas from this book, cacti and succulent gardens can rise to new heights. Throughout the book are innovative container plantings showing cacti and succulents in gorgeous garden planters. All of this serves to illustrate how we can show off the unique architectural beauty of these plants. A chapter is also devoted to the use of art and sculpture in the garden. This title features many examples of flower and leaf shaped garden sculptures. For example, there is a creeping sedum nestled in a flower-shaped vessel. “Garden Details-Ideas, Inspiration, Great Garden Spaces” by Marg Thornell et al was released by Images Publishing. This inspirational book shows how to take a ho-hum garden and turn it into a shining star. It will have special appeal for cacti and succulent gardeners. With lush color photos, this has lots of wonderful ideas for cacti and succulent garden designs. It devotes chapters to each type of garden, growing condition, and garden style. The garden styles range from the minimalist and contemporary to the formal and updated versions of cottage gardens. This also features special kinds of gardens, such as contemplative or spiritual gardens. Readers will especially like the inventive planters and ideas for container gardens featuring cacti and succulents. This also shows how succulents can be included in cottage gardens and perennial borders. There are sections devoted to each type of plant as well, including everything from climbers to foliage plants. Along with various kinds of cacti, this book also features garden designs using tender and hardy succulents. The featured plants include spurges, yuccas, aeoniums, agaves, aloes, echeverias, sedums, sempervivums, snake plants, and Lewisia. One section is devoted to garden designs for dry gardens, including wall gardens. For each season of the year, this book has a section. Following these examples, you can keep your garden looking great throughout the year. Cacti and succulent gardeners will find many helpful design ideas here. This has sections on how to use color, create borders, and choose garden structures. 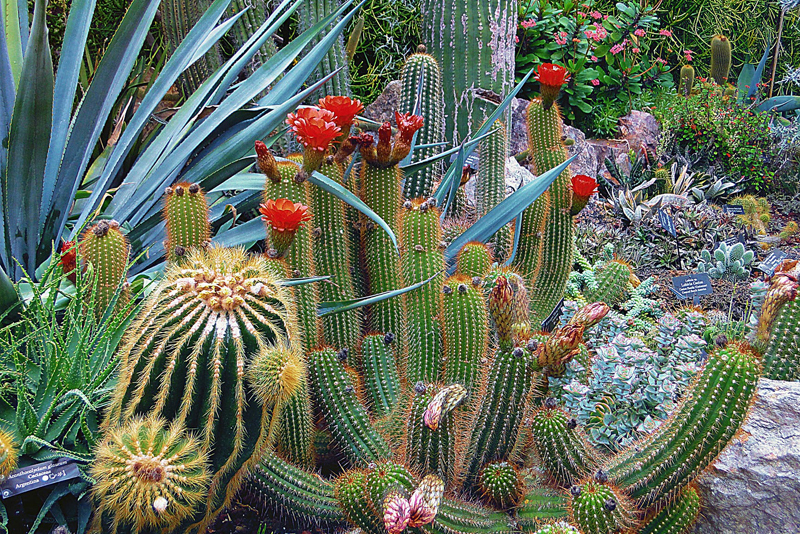 The section on garden art and sculpture are particularly applicable to cacti and succulent gardens. This offers cacti and succulent growers ways to showcase these plants.